Electrical engineering is known to be a popular nowadays field of engineering that deals, in general, with the application and study of electricity, electromagnetism and electronics, which became a first identifiable occupation in the 19th century after commercialization of the electric telegraph, electric power distribution, the telephone and use. Nowadays, the broadcasting as well as the recording media made electronics a part of everyday life. After the transistor was invented, and so the integrated circuit later, the cost of all electronics was brought down to the point when they can be used by almost anyone today. In case you work is related to such field of engineering, then you might find the ConceptDraw DIAGRAM diagramming and drawings software as well as the Electrical Engineering Solution downloaded from the ConceptDraw STORE — another product of CS Odessa — to be very useful. Having the mentioned applications as well as the described solution means having all the necessary tool for achieving your goals in engineering. Nowadays, the electrical engineering has been subdivided into lots of subfields, such as electronics, computer engineering, power engineering, digital computers, telecommunications, radio-frequency engineering, microelectronics, signal processing, control systems and instrumentation. Many of the mentioned sub-disciplines are known to be overlapping with each other as well as with other engineering branches. Thus, there’s a huge number of specializations within the mentioned field of activity: hardware engineering, electromagnetics and waves, microwave engineering, power electronics, nanotechnology, electrochemistry, mechatronics, electrical materials science, renewable energies, etc. Professional electrical engineers usually have a degree in electronic engineering or electrical engineering. Having the professional certifications and being members of the professional bodies (the Institution of Engineering and Technology, the Institute of Electrical and Electronics Engineers, etc. ), all practicing engineers still need a drawing tool, which can help to make any engineering related drawings. If you work as an electrical engineer, then you might definitely be involved in work in lots of different industries having the required skills known to be variable. The range may be within the basic circuit theory all the way up to the management skills, which are required of the project managers. The equipment, same as the appropriate tools, any individual engineer needs on an everyday basis, which is all variable: voltmeter, top end analyser, sophisticated design, manufacturing software as well as drawings software. Having the best software means a lot in any work of any engineer and so the ConceptDraw DIAGRAM diagramming and drawing application can solve many problems helping complete the needed tasks. The process of signal processing is also a part of the electrical engineering activity, dealing with the manipulation and analysis of the signals. Such signals can be analog, varying according to the given information, or digital, varying due to the discrete values which represent the information. For the mentioned analog signals, the process of signal processing is known to be involving the filtering as well as the amplification of the audio signals for the modulation, demodulation of signals and audio equipment used for telecommunications. For different digital signals, the process of signal processing can also involve the error detection, error correction of the digitally sampled signals as well as the compression. Signal processing itself is known to be a very intensive as well as mathematically oriented area, which can form the core of the digital signal processing, expanding with the new applications in every single field of electrical engineering: communications, radar, control, audio engineering, power electronics, biomedical engineering and broadcast engineering. Nowadays, lots of the already existing analog systems are known to be replaced with their digital counterparts as it is more common to use the digital devices. Nevertheless, the analog signal processing is still important in the design of lots of different control systems. The socalled computer engineering deals with the computer systems as well as the design of computers, involving the design of new hardware or PDAs, supercomputers, tablets or the use of computers itself in order to control some industrial plant, for example. Such specialists (the computer engineers) are also known to be working on some system's software or being involved in the process of designing some complex software systems. The desktop computers are known to be representing only a tiny fraction of the devices any computer engineer can work on, when the computer-like architectures can be found now in a huge range of devices, such as DVD players and video game consoles. Working on the desktop computer, tablet or laptop, you can always use any of the solutions provided by the CS Odessa specialists who keep them all in the ConceptDraw STORE application — a very useful tool, which is always available to be downloaded from this site same as the ConceptDraw STORE one. Having the Electrical Engineering Solution downloaded to your desktop means having enough tools for creating any electrical engineering related drawings, such as design elements and the pre-created templates. There are all together twenty-six stencil libraries available for being used by any ConceptDraw DIAGRAM and so ConceptDraw STORE user, such as “Design Elements — Qualifying” one, including the visual representations of such terms as different kinds of Radiation, Multiple-phase windings, etc. The other stencil libraries are “Design Elements — MOSFET”, including the representations of the different kinds of the metal-oxide-semiconductor field-effect transistor types, “Design Elements — Composite Assemblies”, including the representations of Touch sensor, OC computer, etc, and other. There are several types of insulated gate field-effect transistors (IGFETs) in common use. The early term metal oxide semiconductor field-effect transistor (MOSFET) is still in use, and MOSFET is usually acceptable as a generic term for IGFETs. The metal oxide, and the insulation in the IGFET, is the insulating material between the gate terminal and the substrate between the source and drain terminals. This insulator must have very low leakage, of course, but another requirement for good performance of the transistor is that the dielectric constant of the material must be very high. 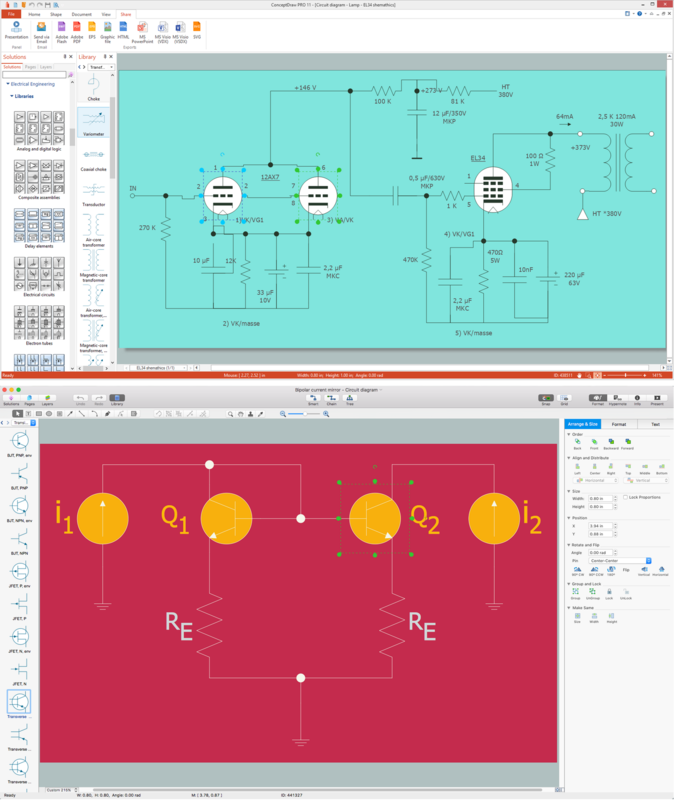 26 libraries of the Electrical Engineering Solution of ConceptDraw DIAGRAM v12 make your electrical diagramming simple, efficient, and effective. You can simply and quickly drop the ready-to-use objects from libraries into your document to create the electrical diagram. An electrical connector, is an electro-mechanical device used to join electrical terminations and create an electrical circuit. Electrical connectors consist of plugs (male-ended) and jacks (female-ended). The connection may be temporary, as for portable equipment, require a tool for assembly and removal, or serve as a permanent electrical joint between two wires or devices. 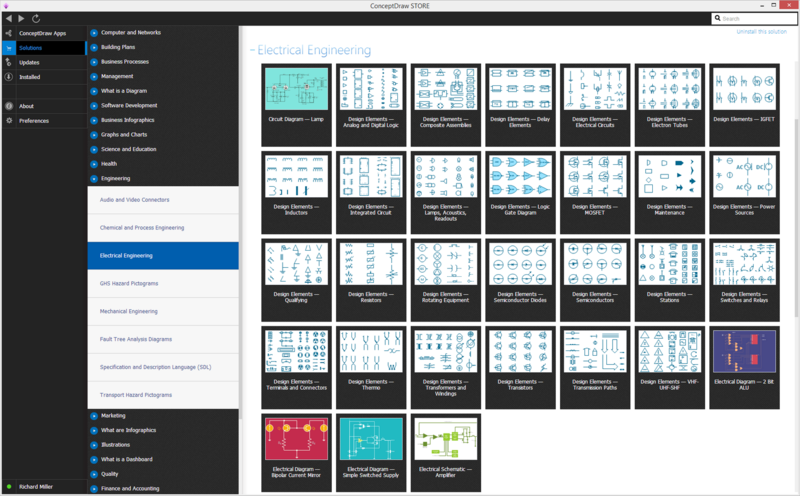 26 libraries of the Electrical Engineering Solution of ConceptDraw DIAGRAM v12 make your electrical diagramming simple, efficient, and effective. You can simply and quickly drop the ready-to-use objects from libraries into your document to create the electrical diagram. The digital communication is a physical transfer of the data over a point-to-point or point-to-multipoint communication channel. Channels can be copper wires, optical fibres, wireless communication channels, etc. The data are realized as electromagnetic signals (radiowave, microwave, electrical voltage, etc.). This example was created in ConceptDraw DIAGRAM v12 using the Computer and Networks Area of ConceptDraw Solution Park and shows the Digital Communication Network diagram.